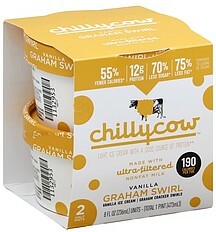 Ultra-Filtered Nonfat Milk (Not an Ingredient in Regular Ice Cream), Inulin, Erythritol, Cream, Sugar, Contains 2% or Less of Natural Flavor, Stevia Leaf Extract (Reb M), Honey, Whole Wheat Flour, Graham Flour, Sea Salt, Soybean Oil, Palm Oil, Nonfat Dry Milk, Sunflower Lecithin, Salt, Skim Milk, Baking Soda, Molasses, Glycerine, Soy Lecithin, Carob Bean Gum, Vitamin A Palmitate. Allergen Information: Contains milk, soy, wheat. Manufactured in a facility that processes almonds, Brazil nuts, cashews, coconut, hazelnuts, macadamia nuts, peanuts, pecans, pine nuts, pistachios, walnuts.